If you’ve driven on Laughlin Road in the past few weeks, you’ve likely noticed that the extension of NE Combs Flat Road has been paved. The streets and all utilities have been extended all the way to Barnes Butte Elementary. Landscaping and an entry monument sign are scheduled to be installed at the corner of NE Laughlin Road and NE Combs Flat Road early this fall. Designs are currently being reviewed. Barnes Butte Elementary is under construction and is still progressing at a favorable pace. The school is still anticipated to be open for enrollment in the fall of 2015. 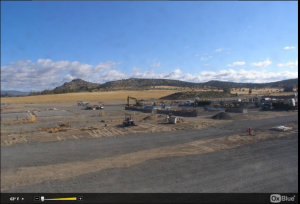 You can see the Live Action Cam that has been set up at the school site to see the progress being made. This entry was posted in Central Oregon, Prineville. Bookmark the permalink.